7/2017 - Added new videos and photos of stitch samples. In this website you can find nalbinding videos, and instructions on how to make nalbinding mittens. "In the past years nalbinding has become a 'fashionable' hobby"
These families cover several different stitches which means there is not only one specific "Finnish Stitch", and not only one "Russian Stitch", but many. An incomplete list of different nalbinding stitches (link). The "two-phased" means that when you take your work off your thumb, lay it flat in front of you, and have a look at the stitches, the yarn goes under-over of two "groups of yarns" (UU and OO), then the direction of the yarn changes, and on the way back, the yarn goes again under-over of two groups of yarns (UU and OOO). In this stitch, Finnish Stitch 2+2, the yarn goes under-over of two "groups of yarns" on both sides of the " / " (point where the direction of the needle turns), so that means this stitch is a two-phased stitch, ie it belongs to the Finnish Stitch Family. And since at the beginning of the stitch the yarn goes first under 2 yarns (UU), and then over 2 yarns (OO), the stitch is Finnish Stitch 2+2, or per Hansen's Notation UUOO/UUOOO. When you use thumb loops, and the loops are still around your thumb, you can simplify things by thinking that "Finnish Stitch 2+2" means that 2 loops stay around thumb, and 2 loops are picked up onto the needle behind the thumb. 2+2 Parikkala style, with plaited edge and connection stitch "under X"
A two-phased stitch will not become one-phased although you would do the stitch with one needle movement. The terms used by Kaukonen (one-phased, two-phased, three-phased) are not connected to the steps of the work, but to the number of the loops: Of how many "groups of yarns" the needle goes under-over. The "three-phased" means that when you take your work off your thumb, lay it flat in front of you, and have a look at the stitches, the yarn goes under-over of three "groups of yarns" (UU, OO and UU), then the direction of the yarn changes, and on the way back, the yarn goes again under-over of three groups of yarns (OO, UU and OOO). In this stitch, Russian Stitch 2+2+2, the yarn goes under-over of three "groups of yarns" on both sides of the " / " (point where the direction of the needle turns), so that means this stitch is a three-phased stitch, ie it belongs to the Russian Stitch Family. And since at the beginning of the stitch the yarn goes first under 2 yarns (UU), then over 2 yarns (OO), and then under 2 yarns (UU), the stitch is Russian Stitch 2+2+2, or per Hansen's Notation UUOOUU/OOUUOOO. When you use thumb loops, and the loops are still around your thumb, you can simplify things by thinking that "Russian Stitch 2+2+2" means that 2 loops stay around thumb, 2 loops are picked up onto the needle behind the thumb, and another 2 loops are picked up onto needle but from back to front (and needle tip to left). Kaukonen also mentions nalbinding "with five loops", but does not specify the grouping of yarns (could be 1+2+2, or 2+2+1, or 2+1+2). This stands for: 2 loops stay around thumb, 2 loops onto needle, and then 1 loop onto needle, but from back to front, and needle tip to right (towards 3 o'clock). I have explained to myself the "Down U/O Up" means - when you look at your work flat in front of you - that the needle tip is inserted into the loop-to-be-turned under the yarn (U), and needle tip is turned downwards (Down). At the same time needle tip goes over the yarn (O). Needle tip is then turned upwards (Up), and a turned/twisted loop forms (bit like a twisted knit stitch). Doing Finnish Turning Stitch without thumb (flat) is possible, but not very practical. Hansen's Notation (& Larry Schmitt's improvement) is, in my opinion, rather difficult to read when it comes to Turning Stitches, and in my own notes I have marked the loop-to-be-turned simply with a letter "t", sometimes "tr" to define the needle tip points to right. Comparing Russian Stitch and Finnish Turning Stitch, there is only a small difference when you pick up the last loop - a tiny, but a remarkable one, as it changes the surface of the fabric substantially! The surface of the Finnish Turning Stitch actually resembles more that of the Finnish Stitch. On the photo below, green line marks how to pick up the last loop in Finnish Stitch Family, ie needle goes straight through, from front to back. Blue line marks how pick up the last loop in Russian Stitch Family, ie the needle is inserted from back to front, and needle tip points to left. Red line marks how to pick up the last loop in Finnish Turning Stitch, ie needle is inserted from back to front, and needle tip points to right. 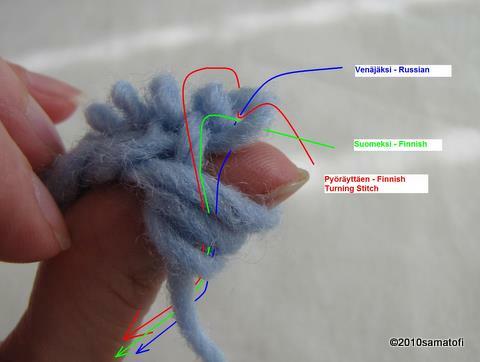 The difference between Russian Stitch Family and Finnish Turning Stitch, is in the direction the needle tip points to when you pick up the last loop. In Russian Stitch Family the last loop is picked up from back to front, and the needle tip points to left ("tl", towards 9 o'clock), while in Finnish Turning Stitch the last loop is similarly picked up from back to front, but the needle tip points to right ("tr", towards 3 o'clock). On the surface of an item made with any of the stitches of the Russian Stitch Family, you can follow the yarn going under-over-under - slash - over-under-over. 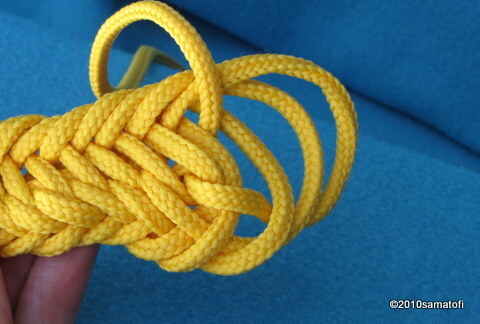 The surface of an item made with Finnish Turning Stitch, on the other hand, resembles the surface of Finnish Stitch, and the last loop, the 'turned' one, is hiding under the topmost loops. 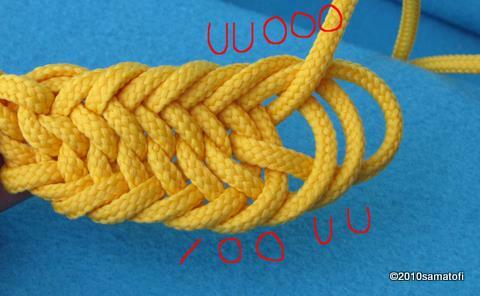 When you move the loops aside, you can see the turned loops below, which look a bit like twisted knit loops. Here's a link to my blog post about the materials of the National Nalbinding Survey in 1957 in Finland. Interestingly enough, the Finnish Turning Stitch defined by Kaukonen (1960), ie 2+2+tr, did not show up in Leinonen's (2000) survey data. Instead, a new kind of Turning Stitch appeared in her nalbinding survey. 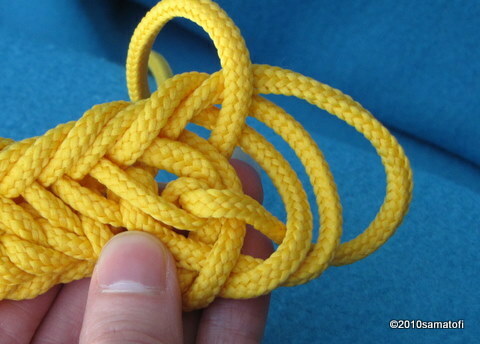 In some of the answers she received, people described a stitch in which "a third loop of five" is 'turned' by hand. Leinonen does not, however, write more about this technique or the direction of 'turning', so at first I made tests and interpretations by myself. "Third loop of five" means, there are 3 loops around thumb, the oldes/topmost of them is picked up and 'turned', so 2 loops stay around thumb, and then 2 loops are picked up onto the needle as usually, ie from front to back. If the third loop is turned by needle, the loop is picked up from back to front, needle tip pointing to left. In this case, the turned loop is not twisted in a similar way is in Kaukonen's definition of Finnish Turning Stitch, but because the finished surface greatly resembles that of the true Finnish Turning Stitch, I have defined this stitch type as Turning Stitch (version 2). To start with, there are 3 loops around thumb, the oldest/topmost of which is picked up onto the needle, from back to front, needle tip to left. This means there are 2 thumb loops staying around thumb, and 1 loop is turned (tl). Next, 2 loops are picked up onto the needle behind the thumb. So that makes 2+tl+2. In this version the turning is done by fingers, anti-clockwise, and only then is the needle inserted into the turned loop. In this version, the turned loop looks again a bit like a twisted knit stitch. 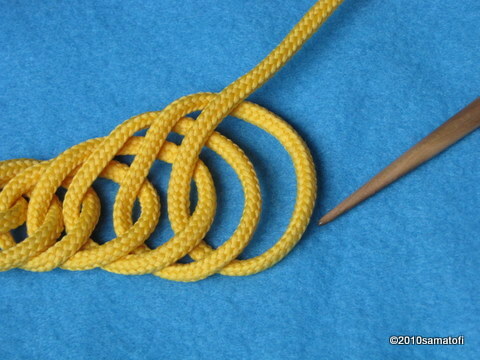 Because the loop-to-be-turned is in the "middle of the stitch", turning to this direction (ie needle tip to right) cannot be fluently done with a needle. In 2011, the older nalbinder I met, told her sister uses the 2+tr+2 stitch (turns loops by fingers anti-clockwise), and she showed me her way of working. But she also showed me a hat, which she herself had made (not her sister), which I assume was made with the 2+tl+2 stitch, instead, because the surface looked like that, and I wasn't able to see little "twisted knit stitch"-like loops hiding beneath the other loops. When I went to see the material of the National Nalbinding Survey in 1957 (in Finland) first time in 4/2010, I noticed on some samples the labels "Russian Stitch" and "Turning Stitch" were confusingly mixed, e.g. in a sample made with Russian Stitch, there was a label "a variant of the Turning Stitch". I thought that was an accident, until later in 6/2015 I went to the archives again, to read through the answer sheets and have a look at the (other) samples, and I found out that for several of the respondents the term 'Turning' had, in fact, meant a Russian way of working. The "one-phased" means that when you take your work off your thumb, lay it flat in front of you, and have a look at the stitches, the yarn goes under or over of one "group of yarns" (U or O), then the direction of the yarn changes, and on the way back, the yarn goes again under or over of one "group of yarns" (O or U). In this stitch, York Stitch, the yarn goes under (over) one "group of yarns" on both sides of the " / " (point where the direction of the needle turns), so that means this stitch is a one-phased stitch. 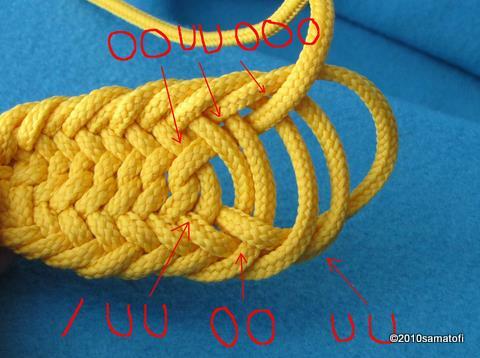 And since at the beginning of the stitch the yarn goes first under 2 yarns (UU), then the direction of the yarn changes, and at the end the yarn goes over 3 yarns (OOO), per Hansen's Notation the York Stitch is UU/OOO. Also the Danish Stitch, O/UO per Hansen's Notation (over - slash - under-over), is a one-phased stitch, and so is the nameless stitch which I have called Double Danish, OO/UUO per Hansen's Notation (over 2 - slash - under 2 - over 1). A two-phased stitch (Finnish Stitch Family) will not become one-phased although you would do the stitch with one needle movement. The terms used by Kaukonen (one-phased, two-phased, three-phased) are not connected to the steps of the work, but to the number of the loops: Of how many "groups of yarns" the needle goes under-over. In addition to the stitch families mentioned above, there are nalbinding stitches which do not fit into the grouping system of Kaukonen, and which have not been used in Finland: among others, Åsle Stitch, Dalarna Stitch, Oman Stitch.